- P.I.P.S is a spreadsheet which can hold 45000 characters. The calculation results can be represented as graphics through pie-charts or histograms. It is also possible to declare macros which will do your common operations. Files created with PIPS can be transmitted to other computers. - CALC is an intelligent calculator software which holds in memory all the operations for later reference. - while EDIT is a simple editor, WP is a real processor with block editing functions and justify functions. 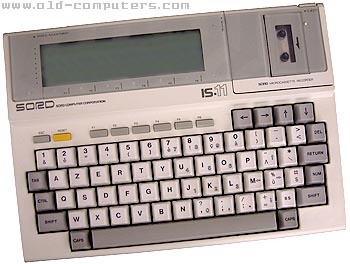 - COMM makes it possible to use the IS-11 as a terminal for another computer. You can thus consult databases, transfer files to or from the microcassette tape at a 9600 bauds rate. - there is also a tool to import files from Lotus-123, Wordstar or Supercalc to PIPS. An orignal feature is that the microcassette recorder is used as a disk-drive ! Files are indexed on the tape so you don't to have know where there are on the tape. Of course it's a bit slow but a C30 tape can hold as much as 128kb. Above the nice keyboard there are 6 functions keys which are used in most applications to navigate through the functions. To help you visualize these, F1 through F6 are written just below the screen. There is a ROM cartridge slot which can be used to plug-in new applications or extra ROM memory (up to 128kb). These ROM cartridges can hold from 8kb to 64kb. "The operating system is so difficult to learn that by the time you get it down, the batteries run out." The IS-11 was followed by the IS-11B and IS-11c. see more Sord IS 11 Ebay auctions !